A plugin for EDMC that retrieves info from Inara and the ROA PVP DB (the PVP bot used in the Galactic Combat Initiative). OmniScanner is a plugin for scanning commanders and gets their background profiles from Inara and from the Ronin of Amarak (ROA) PVP Database. OmniScanner works only when another player is scanned (obviously), after the scan is complete you will receive any info found on Inara or on ROA DB. Open mode is supported, this plugin deactivates itself in solo for obvious reasons and private groups are not supported (at least for now). Full Inara profile with public data. 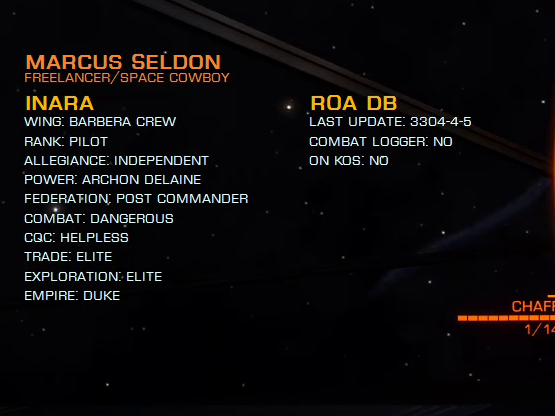 ROA profile with KOS and combat logging commanders. Customizable onscreen TTL (Time To Live) for the overlay. Customizable date format with normal UTC and Elite UTC (330x years). Automatic deactivation when deploying hardpoints. Commander tracking for combat loggers (highly experimental, not public). Customizable overlay through a configuration file (overlay.ini). Supports only 64bit Elite: Dangerous (Horizons) on Windows only. No Apple support (I don't like apples, and I don't have a Mac). "Windowed" or "Borderless Fullscreen" mode only, Fullscreen not supported. This plugin uses EDMCOverlay for displaying info on screen, so everything that applies to EDMCOverlay also applies here. Run the installer for the latest version. Restart ED Market Connector and pray the Great Attractor.